Good times. Anyway, according to a new interview with Metro (via Mashable), Friends executive producer and director Kevin S. Bright revealed that “the break” wasn’t originally part of the plan. After teasing from the very beginning of the show that Ross had a thing for Rachel, the writers figured that finally giving them a happy ending would be the end of their story (presumably opening the door for the much more exciting adventures of Joey and Phoebe). However, Bright says that as soon as Ross and Rachel kissed for the first time, it was like “the air [had] kind of gone out of the balloon” and that it wasn’t exciting anymore. 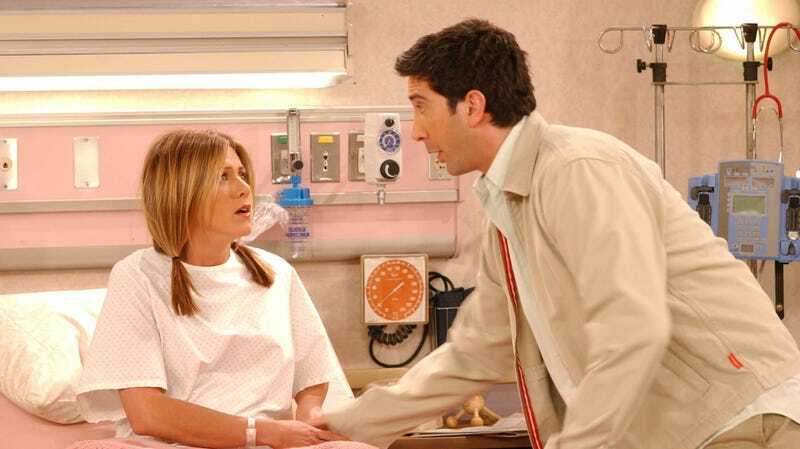 So, to shake things back up, series creators Marta Kaufmann and David Crane decided to make Ross act like a real jerk and have Rachel suggest going on a break. “As soon as everyone got their wish, the wish was taken away,” Bright explained, adding that “it made it so much better when they did get together”—though they did accidentally get married and have a daughter before that really happened. Unfortunately, Bright doesn’t have any other shocking Friends revelations to share, like that maybe Ross was initially going to have no trouble getting his couch up the stairs or that Chandler was initially going to be slightly less homophobic, but maybe he’ll have more Friends mysteries to share in the future.